I wish to share some important facts about the Miracle, Siddhi and the Sanctity of our Sanctum - Japadakatti Bichali. Sunday October 25th.09, I had been to Bichali along with my son Jaiteerth. By the time we reached Bhikshaalaya it was early morning 7 am. Found every where the profound immense silence. Many residents of Bichali, about 90% have lost their houses, food grains, home articles, crops and all. People were simply afraid, no joy on their faces. They looked as though they have become desperate and confused always thinking about the future. What to do next? Worried about the safety and the security of the property which they owned! The hopes of lurking desire was no more ! As they have not still come out from the Rudraavatara of Varunadeva and the horror of the flood. They cannot forget. Water plays an important part in our life and living. Without Water we cannot survive and the incessant rain and abundant water will ruin us. This is the same fate right from Gillesugur Camp - Bichali - Rampur to Mantralaya.. Water is still standing in the fields, all the hay stock is washed away and completely spoilt. Several big trees have become a prey to the flood. While we were entering Bichali, people talked themselves that the Devotees of Sri Raghavendrateertharu and Japadakatti Bichali Appanacharyaru are visiting the sanctum. While seeing the people of Bichali, my memory went back to the days of our Kind Gururayaru's Divine Help to the people of Tanjore. Tanjore suffered heavily for 12 years due to the severe famine. After the visit of Tanjore king VijayaRaghavaNayak to Kumbhakonam Rayaru immediately the very next day went to Tanjore with all the valuables including the food grains to face the grave situation of famine. First gave all this to the king and asked him to distribute to the public. Sri Raghavendrateertharu after taking a round in Tanjore in the evening, Prayed the Lord Sri Hari and Dhaanya Laxmi, three days and three nights sat in the Dhaanyaagara and observed fasting - Upavaasa. After three days when they opened the door of Dhaanyaagaara they found Rayaru sitting amidst the full of food grains in that Room. Then performed Yaaga for a month continuously and permanently removed the famine .It is quite amazing that from that day onwards Tanjore has never experienced any famine even to this day. Rayaru thus distributed, enhanced and enriched the Punya. The Japadakatti Bichali environment is plunged and merged in profound and immense silence like a Tapovana. Only the sound of the flow of Tungabhadra will be echoing and heard. Sacred and holy Ek ShilaBrindavana installed by Sri Appanacharyaru with great devotion and affection as per the order of Rayaru is a Siddhi place quite safe. The big trees have washed away, 13 pillars of the Madhavaram bridge is collapsed and the long road is washed away completely and the means of transportation is fully cut off. Still all the Sacred idols are safe. Water was more than 20-25 feet above the EkShila Brindavana, though the Tungabhadra flow was forceful, yet nothing happened to the Daivee Sampattu of our Japadakatti. Quite safe, standing majestically, proclaiming to the world that this is the real Siddhi of Sri Hari - Sri Vayudevaru - Sri Raghavendrateertharu. They have moved not even an inch. As already described Rayaru stayed in Bichali along with Appanacharya for a long time. The most important and the precious time Rayaru had spent in Bichali. Lived in the house of Appanacharya accepted his seva happily. In the middle of Tungabhadra there was a wide hilly rock bed. Rayaru and Appanacharyaru together were going there and used to sit for hours together discussing several matters pertaining to knowledge and Acharya Madhwa Philosophy. In other words we can say that was nothing but a Divine Satsanga. 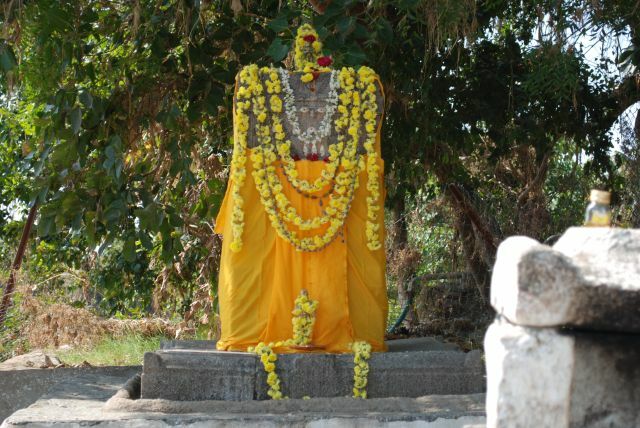 There Appanacharya built a plarform - katti that was very famous and called as Sanyasikatti. This went on for a long time. In course of time owing to the collection of thick sand and the growth of the trees made this Sanyasi Katti invisible. Today the recent flood has washed away the sand and the trees, everything is clearly visible. We are fortunate enough, that we saw SANYASIKATTI. As though it is the will and wish of Rayaru that the famous Sanyasikatti should be introduced to the world devotees from now on wards and the will of Sri Hari and Sri Vayudevaru. The entire daily divine routine of Pooja, Alankara, Naivedya, Vaishwadeva, Hastodaka are all dear to our Sri Raghavendrateertharu at the sanctum of Japadakatti. It is quite appreciable that even during this period that Sri Teerthha Kshetra Japadakatti Bichali Appanacharya Ashtottara Shata Seva Welfare Trust has conducted the Ashtottara at this sanctum on the second Thursday without fail and Hastodaka - Anna Daana are continued towards the welfare of the world devotees. What a noble and divine global project this Ashtottara Shata Seva Welfare Trust. Words fall short to praise this great task. By the Anugraha of Rayaru even the small silver Dandakashthhaka which was at the Brindavana is quite safe along with the eyes and the Naamas. Even the Nagaloka built of mud is amazingly safe. The Ek Shila Brindavana is open to the Sky, that was the place where our Appanacharya had the Open University, Sri Vibudhendrateertharu, Sri Sripadarajaru, Sri Jitamitraru Sri Vyasarajaru and Sri Raghavendrateertharu have all performed Japa, Tapa and Anushthhaana. So lot of Siddhi and Divine Bliss is there with full of wonderful vibrations. We forget ourselves with satisfaction and gratitude. Surrender to this Sanctum just as our Bichali Appanacharyaru has surrendered and squatted before Rayaru. Such Hanumanthadevaru's Bhaktaru is our Rayaru. It clearly clarifies that Rayaru and Hanumanthadevaru took the responsibility to save this sanctum full of Siddhi.